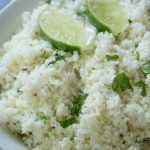 This recipe makes the perfect side dish of cauliflower rice! It's light, fluffy and low carb. A delicious substitute for rice. In two to three batches, pulse cauliflower in a food processor until it’s a rice consistency. Add in cauliflower, sprinkle in seasonings and stir often for 5-7 minutes or until desired tenderness. to make cilantro lime rice add 1/2 tsp oregano, 1 tbsp minced cilantro, and 1 tbsp lime juice.